Note: This tips based on Android Mobile Device version. 1. Elves Realm game is a Card Based Game and you will started with 1 Deck. 2. Your Deck consist of Cards and Runes. You may have more than 1 Deck but you can only activate 1 Deck to battle. 3. You may want to configure 1 Deck consist general type of Race, while other Decks consist mostly of 1 type of Race. Because the Deck with mostly of 1 type of Race and combine with the correct Rune mostly will be superior at the Battlefield. 4. Cards is just like your armies, while Runes could assist in your battle when the Rune is active. To make the Rune active, there will some condition to met at the battle. 5. Here are a few ways to get a Card: buying, exploring a map, finding a chest, defeating a Thief, buying from clan's store (if you are a member of a clan) and also winning special Elves Realm events. 6. Here are a few ways to get a Rune: exploring a map, finding a chest, defeating a Thief, meditate at the Temple and winning special Elves Realm events. 7. The Star in Elves Realm game is to determine how good the Cards or Runes are. The more the Star is the better. For an example the 5 Star Card is better than the 4 Star Card, the 3 Star Rune is better than the 2 Star Rune, etc. - If you enter the Invitation Code when you sign up an account for Elves Realm game. If you don't have the Invitation Code, you may want to use this Invitation Code: 44te2a. - Inviting people with your invite code. You'll get 1 Magic Ticket once you "succesfully" invite 1, 5 or 10 people to the Elves Realm game, 2 Magic Ticket for 15 People and a Time Traveler Card (4 Star) for 20 People. "Successfully" means they complete the "Guide for Beginners", which mean completing Map 1-1 and Map 1-2. - Daily Rewards. There is an Elves Realm event that give you rewards, including Magic Ticket, when you login to the Elves Realm game everyday. - By sharing to Facebook after you've manage to finish a map, gain 4 Star Card or gain 5 Star Card. - Magic Chip Collection. You can see the Magic Chip Jigsaw at the Store then click at the Chips. The Magic Chip Collection consist of 9 Chips. You can get the Magic Chip piece when you Exploring a Map (3 pieces), Winning a Free Match in the Arena (3 pieces) and at the Chest in any Maze (3 pieces). Click at the Chip Part to see the location to acquire that part of the chip. If you manage to collect all the 9 Magic Chip, it will automatically change into 1 Magic Ticket that you can use. 11. If you want to explore a map, just choose the last map that have more star that you've already conquered for better rewards. If you've complete the Hard level of the map and you explore that map, you will gain more rewards better than if you explore next map that you only conquered the Easy or Medium level. - You can buy Card from Clan's Store. Sometimes you can buy a hard to get Card here. 13. When you travel through Maze and complete the last level by defeating all monsters and open all chest at the last level, but the maze still not complete, go back to the previous level. You may accidently left a monsters or unopened chest at the previous level. Defeat all monsters and open all chest at the maze to complete it. 14. When you do the battle and you are pretty sure that you gonna win, you can always do the fast battle. To do the Fast Battle, just press the SKIP button. If you didn't see the SKIP button, then you are in the Manual Battle Mode (such as at the Maze, Free Fight with others players, etc), just press the AUTO button first, then you'll see the SKIP button. 15. Sometimes Elves Realm make an event called Chop Shop. At Chop Shop event, you can get bones from opening a chest at the Maze. To optimize your bones achievement, better before Chop Shop event begin, you must reset all Maze to level 1. By doing that, when the Chop Shop event begin, you can complete the maze and gain some bones, after that you can instantly reset the maze with your available free reset maze option, and then gain some bones again at the same maze. 16. If you manage to complete entire maze at a map and you still want to hunt for greater star cards (eg. you've complete the maze at Map 8 and still searching for 5 star cards), you can reset the maze and then focus to destroy only the chest and try to avoid the monsters at all cost. By doing that, you can save your energy for later use. In my past experience, when I do that strategy, I manage to get 5 Star Card (Soul Reaper) and 4 Star Card (BearWarrior). You can also use this strategy at Chop Shop event, by focusing to destroy only the Chest, to optimize your bones achievement. 17. The more stars you've revealed on your map, the more income you'll receive the following day. - Card Compose function will unlock when you reach level 30, you can find the button by tapping "Enchant". - Tap [Enchant] - [Compose Scrap] to interface of composing card. - You can exchange Cards by collecting relevant Scraps. - Where to get Scraps: Daily Login, Magic Pack, Legendary Thief, Dungeon, some events and so on. - When you get scraps of a Card, this card will show on the Compose. - You need sufficient Scraps and Gold before composing a card. - When you get enough Scraps, you need to compose a card manually. Only one card can be composed each time. After successful compose, this card will send to your inventory. - The order of Scraps list displays as: 5 Star Card, 4 Star Card and Universal Card. - Universal Scarps can be used to fill the missing scraps of any cards and to compose cards. - Before using Universal Scraps, make sure that you have at least one scrap of a card. Otherwise, system cannot find the target card to compose. - You can choose "use Universal scraps first" or Card scraps first. If you choose Universal scraps first, when there is not enough universal ones then card scraps make up the deficiency. - Available to compose label will show up when you collect enough scraps for composing a card (including Universal Scraps). - Universal Cards can only be composed by Universal Scraps. - Universal Cards can be only used to "Evolve" and "Shuffle" while Universal Scraps can be used to Compose Universal Cards. - You will see Universal Cards when you equip deck or when you choose material card to evolve or shuffle. - When you have more than one Universal Scrap, Universal Card will show at the end of Compose List. If you have no Universal Scrap, you cannot see Universal Card in Compose List. - 100 layers in total, players need to explore it layer by layer from the very first Layer every day. Tap [Arena] - [Dungeon] to enter. - Dungeon will unlock when you reach level 30. - Everyone can only be able to explore once a day and Dungeon will reset every day. So you have to begin at the Layer 1 next day. - Every player has 2 lives every day. If you use them up, then you are not be able to keep exploring anymore unless you purchase more lives. You will lose one life when you lost a battle. - If you clear 30 Layers on the first day, you can SWEEP to layer 10 directly next day and begin exploring from 11th Layer. - If you clear 50 Layers on the first day, you can SWEEP to layer 30 directly next day and begin exploring from 31st Layer. - If you clear 70 Layers on the first day, you can SWEEP to layer 50 directly next day and begin exploring from 51st Layer. - If you clear 90 Layers on the first day, you can SWEEP to layer 70 directly next day and begin exploring from 71st Layer. - Each time you enter next layer, you have to win the previous battle. - If you want to get extra rewards then you have to meet special requirements. You can keep exploring next layer if you win the battle but not meet the special requirements. The Layer who contains extra rewards will display a Chest on the right. - Each time you clear a Layer, you will get Rage and you can use Rage to exchange BUFF. - You can only have 1 BUFF at one time, and it will disappear at the next battle. - Every time you exchange a BUFF will cause certain CD (Cool Down Time). You can use Crystals to reset it. - BUFF can only be effective in Dungeon. - If you cannot see the whole details of a specific BUFF, please push the letters of the BUFF upwards. Then you can see the whole information of the BUFF. - Dungeon's Ranking is according to how many Layers you have explored. The more Layers you explored today, the higher rank you get. If 2 players on the same Layer, then the one cleared earlier comes before the later. - Dungeon's Ranking will be reset every day. - Top 5 players in Dungeon's Ranking will receive rewards from the system. - Raider will open as an Event. - Players who reach level 15 can participate in. - You will see the entrance of a Raider on main screen after the event begins. - Once Raider event starts, you cannot explore Thief anymore. - The rules of Raider are similar as Thief. During Raider event, you have certain chances to encounter BOSS Lilith by Explore. - Same as Mysterious Thief, when you find BOSS Lilith, your friends can also go to fight with her. - Just like Mysterious Thief, BOSS Lilith will disappear if no one defeated her within a given period. - Everyone can only find one BOSS Lilith a time. - BOSS Lilith is classified into 5 different levels: from low to high is White, Green, Blue, Purple and Orange. - BOSS Lilith will randomly appear, the fourth level BOSS Lilith won't show up until you defeal all previous 3 Levels (BOSS Lilith must be found by yourself) and the Level 5 BOSS Lilith will appear with certain possibilities after you win the battles between all 4 levels (BOSS Lilith must be found by yourself). - You can get point by attacking BOSS Lilith, the higher level BOSS Lilith the more points you can get. - When your friends find BOSS Lilith, you can also go to attack her. But different with Thief, friends can only see the BOSS Lilith after discoverer give the first attack. - It is highly possible to find high level BOSS Lilith in late stage of Raider event. - Friends of discoverer will also get some point from battle. You can check it on Friends Contribution. 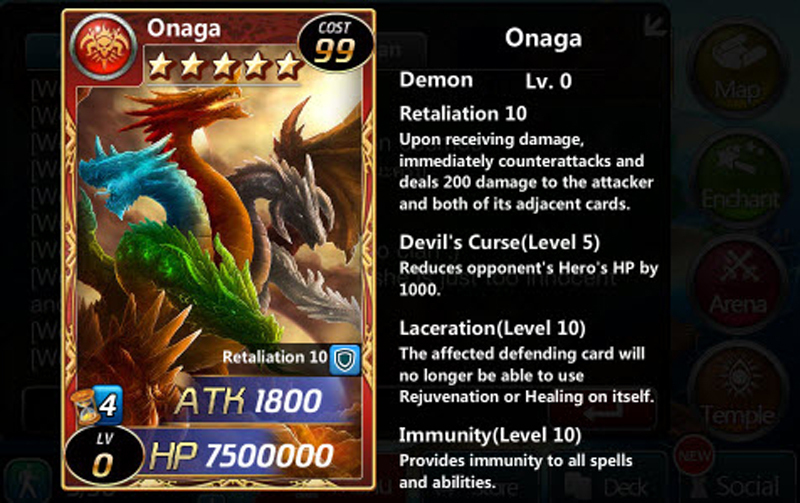 - During Raider event, event cards will have an increase of HP and ATK. And those cards will be back to normal after event ends. - The Cool Down Time (CD) will add 10 minutes after each battle with BOSS Lilith. - If you have more than 30 battles with the BOSS Lilith which is found out by your friends, the CD will increase to 30 minuters (per battle) afterwards. And the CD of BOSS Lilith which find out by yourself will still remain the same (10 minutes per battle). - The CD will be reset everyday at 00.00 (GMT +8) during the event period. - During the Raider event, the Clan Leader or Deputy is unable to admit or kick out the clan members. At the same time, the Clan Members are unable to leave the clan. - If player is unable to kill Nightmare BOSS Lilith or Extreme BOSS Lilith within the limited time, the discoverer could find back the same BOSS Lilith again by exploring. By then the BOSS Lilith will remain the same status as the last battle. The times of Round will restart from zero even though the BOSS Lilith has been hit before. 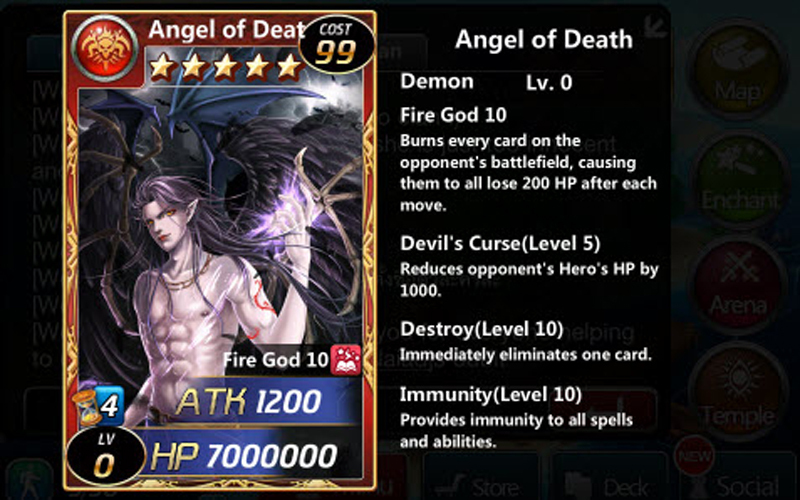 - Because the enemy forces and the BOSS Lilith usually has more HP than your armies, it would be better if you fill your armies that have Warpath skills to do heavy damage to the enemy forces and also to the BOSS Lilith. - King of Kings is a Player VS Player battling event. - In the King of Kings event, all participant will be automatically gain level 100. But if the participant exit the King of Kings event, the participant's level will reset back to normal. - First you must choose available random level 15 cards that system has drawn it for you. After you've select enough card, you will create 1 deck to fight for you. Then you must select the 15th skill at each card. - Keep in mind, card order is extremely important, and may even decide the match! Because the battle in King of Kings event is different with the regular battle. At the King of Kings event, the card that enter the battle field is the same order with the order of your deck. So, this is where your strategy come into play! - Every player has 5 lives every day. If you use them up, then you are not be able to keep fighting other participants anymore unless you purchase more lives. You will lose one life when you lost a battle. - When you win 4 battle, the system will give you a chance to draw a new level 15th card. You can use this new card to swap your available card in your deck. But keep in mind, your maximum total cost of your deck is 160. - You can use your crystal to draw another level 15 cards, change your 15th skill of each card and buy more live. - Land Scramble is a PvP event between Rebel Tribe forces and Royal Guard forces. - Anyone who reaches level 25 can join the event. - You can apply for it 30 minutes before the event get starts. After you've applied, the system will randomly assign you either into Rebel Tribe forces or Royal Guard forces. - At Land Scramble, you will enter a new world, where you must move at one location to another location, starting from your side Headquarters. - Every action you make, such as move your character to a location or collecting stones, you will wait for your CD (Cool Down) time reach 0 before you can make another action. As usual, you can use your Gems to decrease your CD Time. CD Time between move action and collecting stones action is separated, so you can do both at the same time. In example, after you move your character to a mining location, you can collecting stones without waiting your movement CD Time reach 0. - During the event, player can earn Honor by collecting stones and battling with other forces. But keep in mind that battling will give you more Honor. 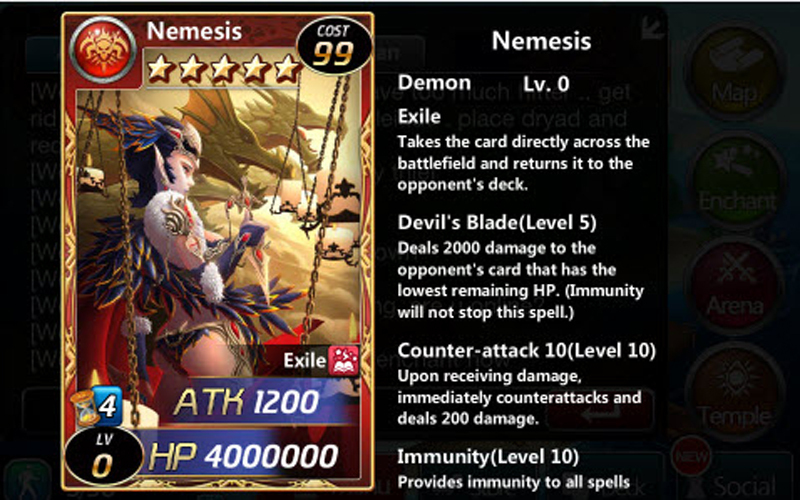 - During the event, when players occupy priest altar, their and allies cards attack will be enhanced. 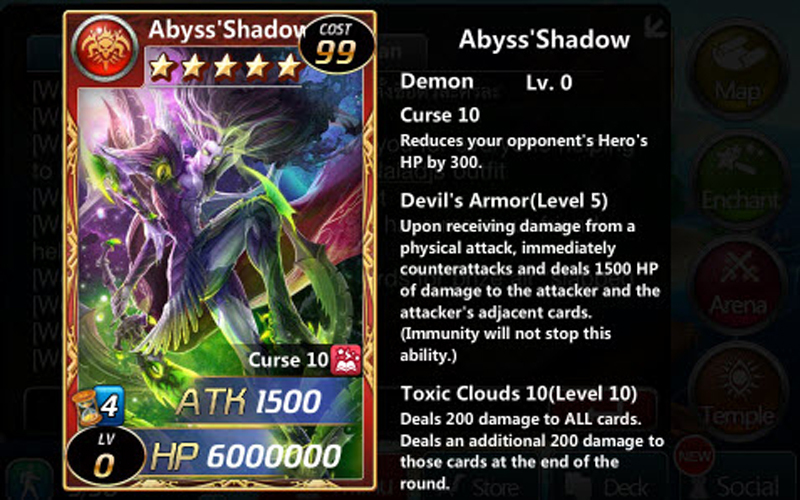 - During the event, when players occupy Bishop altar, their and allies cards HP will be enhanced. - When the disparity is huge between two forces, in order to make the event more balanced, the system will apply a "concerted efforts" BUFF on each player of the weaker force. This BUFF will enhance all cards HP upper limit and attack. - After the Land Scramble finished, you can exchange your Honor points into Stones by opening your Chest at your Home Screen and claim the prizes. - Players can exchange Stones for the items they want in the Mystery Store. Please note that Stones cannot be used in any other places. - The Mystery Store will be available after the Land Scramble finished. But keep in mind that the Mystery Store will be opened only at a short of time. 26. The higher your Hero's HP is, the easier it will be to defeat your opponent. 27. The more you Enchant your rune cards, the more powerful they will become. 28. Quick Strike spells are activated when the card enters the battlefield. 1. Your Cards can be level up to level 10 (or up to level 15 if you use the Evolve function), while your Runes can be level up to level 10. 2. To level up your Cards, you need Gold and Materials. The Material Cards are the other Cards. This material cards will be gone forever after you use it in the level up process. 3. To level up your Runes, you need Gold and Materials. The Material Runes are the other Runes. This material Runes will be gone forever after you use it in the level up process. 4. Because the Cards that had been used as Material will be gone forever, you may want to use Cards that you are no longer want to use and you may want to consider your duplicate card (The exact same Card that you have more than 1). Also, if you have a Turkey Card, you can use that card as your material card to boost experience point so your card could level up much faster. 5. Because the Runes that had been used as Material will be gone forever, you may want to use Runes that you are no longer want to use and you may want to consider your duplicate Runes (The exact same Rune that you have more than 1). 6. To level up your Cards, you can use this menu: ENCHANT => ENCHANT CARDS. Click at TARGET CARD to select which card you want to level up. 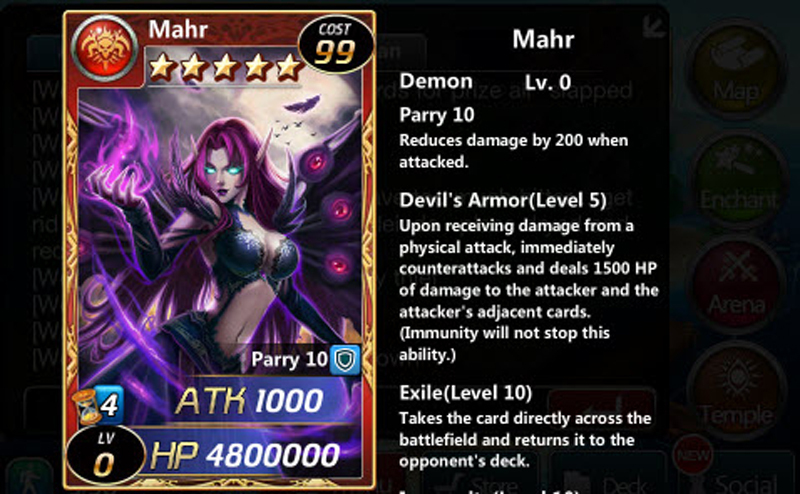 Click at MATERIAL CARDS to select which cards you want to use as Material Cards. Keep in mind, the more Cards you use as the Material Cards, the more experience you could use at leveling process. Then you can click PREVIEW button to see the expected result if you click the ENCHANT button. With this, if you didn't satisfied with the expected result, you can re-arrange your Target Card and Material Card. And if you satisfied with the expected result, you can Commit by click the ENCHANT button. Keep in mind, if you level up your card to the Maximum Level, you should use your PREVIEW button before click the ENCHANT button. Then try to reduce your Material Card and click the PREVIEW button again. With this way, you ensure that you didn't wasting your Material Cards. - You have 10 Cards as your Material Card. Then when you click the PREVIEW button, your Target Card goes to maximum level. - Reduce your Material Card to 9 Cards. Then when you click the PREVIEW button, your Target Card still goes to maximum level. - Reduce your Material Card to 8 Cards. Then when you click the PREVIEW button, your Target Card didn't reach the maximum level. - Adding 1 Card again to your Material Card to 9 Cards. Then when you click the PREVIEW button, your Target Card still goes to maximum level. Click the ENCHANT button to level up your cards. With the above example, you just only use 9 Cards instead of 10 Cards in leveling process. 7. To level up your Runes, you can use this menu: ENCHANT => ENCHANT Runes. Click at TARGET Rune to select which Rune you want to level up. Click at MATERIAL Runes to select which Runes you want to use as Material Runes. Keep in mind, the more Runes you use as the Material Runes, the more experience you could use at leveling process. Then you can click PREVIEW button to see the expected result if you click the ENCHANT button. With this, if you didn't satisfied with the expected result, you can re-arrange your Target Rune and Material Rune. And if you satisfied with the expected result, you can Commit by click the ENCHANT button. Keep in mind, if you level up your Rune to the Maximum Level, you should use your PREVIEW button before click the ENCHANT button. Then try to reduce your Material Rune and click the PREVIEW button again. With this way, you ensure that you didn't wasting your Material Runes. - You have 10 Runes as your Material Rune. Then when you click the PREVIEW button, your Target Rune goes to maximum level. - Reduce your Material Rune to 9 Runes. Then when you click the PREVIEW button, your Target Rune still goes to maximum level. - Reduce your Material Rune to 8 Runes. Then when you click the PREVIEW button, your Target Rune didn't reach the maximum level. - Adding 1 Rune again to your Material Rune to 9 Runes. Then when you click the PREVIEW button, your Target Rune still goes to maximum level. Click the ENCHANT button to level up your Runes. With the above example, you just only use 9 Runes instead of 10 Runes in leveling process. 8. Regarding your Cards, you can use EVOLVE function to evolve your card so you can level up your Card to level 15 and gain 4th skill. Keep in mind that the 4th Skill is random and will be activated when your evolved Card reaching level 15. 9. To evolve your Cards, you need Gold and 2 of the same 10th Level Card. The first 10th Level Card will be used as the Evolve Card, while the other one will be used as the Material Card. The Material Card will be gone after the Evolve process finish. - To be able to Evolve, you must NOT USE both of your card (the Evolve Card and the Material Card) at your Deck. 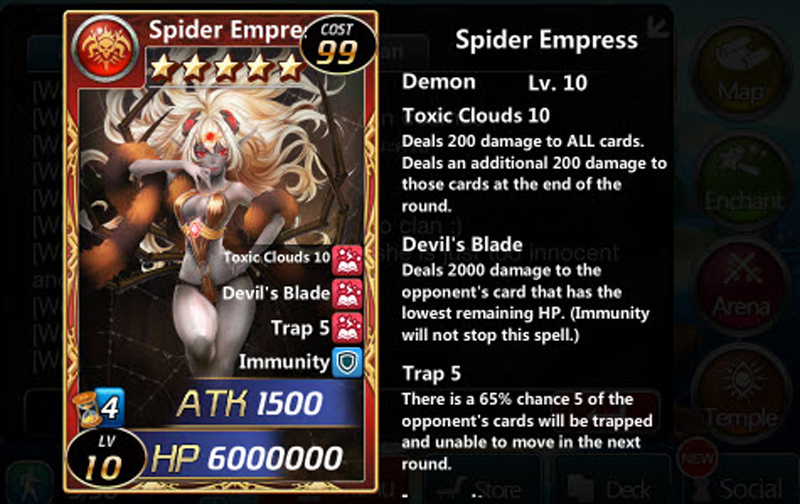 - For 5 Star Cards, you can Evolve only at 5 Star Evolution event, such as at March 22nd 13:00-18:59 (GMT +8). - For 5 Star Cards, you also can Evolve using Universal 5 Star Card. 10. To evolve your Card, you can use this menu: ENCHANT => EVOLVE CARD. Click at the SELECT THE EVOLVED CARD to select which your 10th level card to be evolved. Clik at the SELECT THE MATERIAL CARD to select which your 10th level card as the Material Card. Then you can click PREVIEW button to see the expected result if you click the EVOLVE button. With this, if you didn't satisfied with the expected result, you can re-arrange your Target Card and Material Card. And if you satisfied with the expected result, you can Commit by click the EVOLVE button. Keep in mind that the 4th Skill that shown in PREVIEW may not the same when you click the EVOLVE button, because the 4th Skill you will get is always random. 11. After you've evolve your card, you may disappointed with the 4th Skill. To change the 4th Skill, you can use the SHUFFLE SKILL function. But keep in mind that the Shuffle Skill is also random. 12. To Shuffle Skill your Cards, you need Gold, your Evolved Card and 1 of the same Card with your Evolved Card but with any level. 13. To Shuffle Skill, you can use this menu: ENCHANT => EVOLVE CARD => SHUFFLE SKILL. Click at the SELECT THE TARGET CARD to select your evolved card. Click at the SELECT THE MATERIAL CARD to select your other card that the same type with your evolved card but with any level. Also, the skill will be different between what your card have now and the next one after the Shuffle process. - You must examine the opponent's Runes. You may want to focus on what "you can control", example if the Rune's Description said "When your opponent..." then you can prevent the condition will be fullfill and make sure the Rune will not activated. - If you have a chance to deploy your armies before the opponent, FIRST check the opponent army capability that ready to deploy to the battlefield. You may want to delay your deployment (by pressing PASS button) if you have the Hell armies unit, while the opponent ready to launch the Kingdom units with the Helo Ability or any Quick Strike ability. - You may want to delay your deployment, if you think that your available unit too vulnerable to opponents unit. Just delay for 1 to 2 turn (you may want to watch your Hero's HP), so your others unit are available and you can deploy all together for massive starting damage. - Keep watch out for the ability of opponent's active Rune. You do not want to deploy your Kingdom Mage to the Battlefield, while there's opponent Rune that activate with the Reflection ability. - When you facing multiple opponents that have Reflection ability, you may want to delay your armies that have multiple magic attack, such as Kingdom Mage, Forest Elf Wizard, etc. 3. Using multiple cards with Snipe will allow them to combine their powers and be more effective. 4. Despair Spells will be cast just before the card is sent to the cemetery. 5. A card that is stuck in a trap will not be able to attack in the next round. 6. Wilderness cards all fear Vulnerability, so use it when you fight them! 7. Craze and Bloodsucker will increase your attack! When paired with a Healing Card it can create the perfect combination.